At the outset let me thank the organizers for giving me this opportunity to speak from this platform. 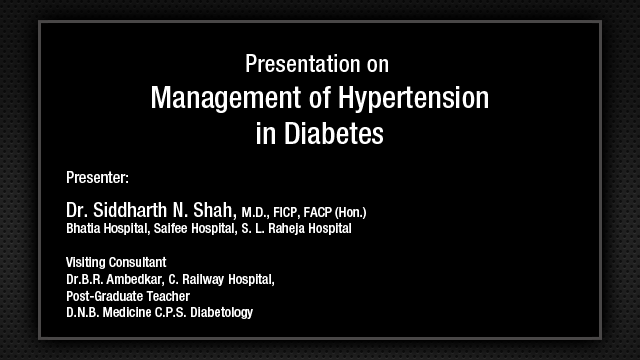 My subject is measurement of blood pressure and its implications. This is the first measurement of blood pressure in an animal, Stephen Hales in the year 1733 inserted a brass cannula into the carotids of a horse and it was observed that the blood risen in the brass tube under pressure. We know the definition, the force exerted by the blood against the blood vessel wall, the highest being the systolic and the lowest being the diastolic. Blood pressure measurement is often considered routine and is often performed by those least trained and here comes a bombshell. 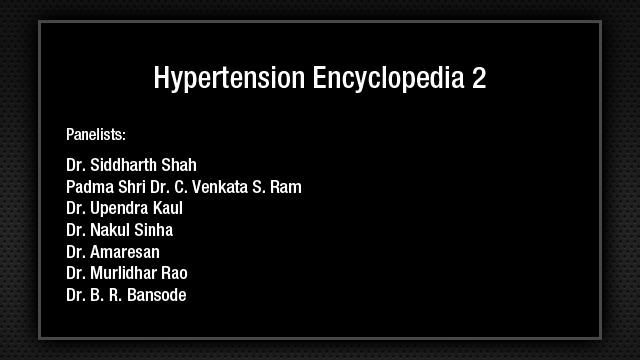 It is published in Hypertension: A Companion to Braunwald's Heart Disease edited by Black and Elliott in 2013, "neither the beginning medical students who claimed to have learned proper BP measurement technique nor practicing nurses in Australia or Taiwan nor physicians in India nor general practitioner in Newfoundland had sufficient knowledge to pass a standardized test regarding correct technique in BP measurement" and this is evidence based on a few studies. What happens if there is a small error in BP measurement, this is the cutoff point of the diastolic blood pressure in the American population, 90 mm, this part is hypertensive. If there was an error of 5 mmHg plus, in that case 27 million people would have been stamped as hypertensive. These are the different sources of error in BP measurement, conversation with observer, no rest period, AFib, white coat effect, alcohol, caffeine, smoking, full bladder and bowel, crossed legs, Korotkoff IV taking as the diastolic blood pressure, digit preference, etc. I will discuss this under 4 headings: BP measuring methods, recording at clinic, special issues and special situations. BP may be measured by auscultatory method, oscillometric method, finger cuff method of Penaz, ultrasound technique and tonometry. The last 3 since they are not routinely used, I will not discuss them. I will just confine to the first two. Korotkoff's method is still the key method. We all know about the 5 phases. Phase I being the systolic and phase 5 being the diastolic. Phase IV, we consider as diastolic in exceptional situations where we can hear the Korotkoff sounds down to 0. Limitation is systolic blood pressure is underestimated and the diastolic blood pressure is overestimated by this method if we compare it with intra-arterial records and auscultatory gap should be kept in mind. This mercury sphygmomanometer is considered to be the gold standard. This measures the blood pressure directly by observing the height of column. Errors of calibration cannot occur unless the markings are wrong and this has been used in most of the clinical trials because of their accuracy. Aneroid sphygmomanometers, the pressure is registered by a mechanical system on metal bellows that expands as cuff pressure increases and a series of levers that register the pressure on a circular scale. It loses its stability over time, particularly if it is handled roughly. It is inherently less accurate than mercury and accuracy varies from manufacturer to manufacturer and this needs to be validated every 6 months ideally. Coming to the oscillometric technique, the principle is when oscillations of the pressure in a sphygmomanometer cuff are recorded during the gradual deflation; the point of maximum oscillations corresponds to the mean intraatrial pressure. By this technique, we assess the mean pressure and we cannot directly assess the systolic or the diastolic pressures, which are derived by an empiric calculation. It can be used in noisy environment, that is the advantage, but they are not designed to be used in arteriosclerosis, in irregular arrhythmias, preeclampsia, pulsus alternans, pulsus paradoxus. Blood pressure readings defer from those determined by auscultation and vary subject to many factors like pulse pressure, heart rate and arterial stiffness, so this method again needs to be validated with a sphygmomanometer. How to validate them? Using a Y tube, putting in the pressure and one needs to compare the aneroid with the mercury column. For an aneroid to be used, its error should be maximum +/-3. If it is more than that, it should not be used, so also the electronic device should be validated and calibrated with a sphygmomanometer. Some hybrid sphygmomanometers are coming up, which combines features of both electronic and the auscultatory device. Here, the mercury column is replaced by an electronic pressure gauge such used in oscillometric devices. These hybrid manometers have the potential to become a replacement for the mercury because it combines some of the best features of both, mercury and the electronic devices. Coming to the recording at the clinic: Three issues; subject preparation, device preparation, and the recording proper. Factors, which affects the pressure recording, I have already mentioned some of them: Room temperature, exercise, alcohol or nicotine consumption, positioning of the arm, muscle tension, bladder distention, talking, and background noise. It should be measured in a quiet, private, comfortable environment with good lighting. The patient should be sitting on a chair, but here lies a basic difference. The American guidelines and in Americans, they measure it in a sitting posture, but in most of the part of Europe, it is done in the recumbent posture and there is a positional difference between these 2 postures. Sitting in a chair with a backrest, one should not be sitting on an examination table without any backrest because in that case there will be an error. Feet should be flat on the floor, leg should not be crossed. The patient should not talk prior to or during the procedure. Arm should be supported at heart level, that is, the 4th intercostal space is considered to be the center of the right atrium. The patient should be asked to remove all clothing that covers a location of the cuff placement and procedure should be explained. Caffeine, exercise, and smoking should be avoided for at least 30 minutes prior to the measurement. The patient should be seated quietly for at least 5 minutes before one measures the blood pressure and at the initial visit, BP should be measured in both the arms. Let us come to the effect of different body position: DBP measured while sitting is higher than when measured in the supine position by about 5 mmHg. When the arm position is meticulously adjusted so that a cuff is at the level of the right atrium SBP has been reported to be 8 mm higher in the supine posture than in the upright posture. When measurements are taken in the supine position, arm should be supported with a pillow. If the back is not supported, DBP may increase by 6 mm. Crossing of the legs may raise the systolic pressure by 2 to 8 mm. Talking may raise the SBP by 10 mm and listening may raise by 5 mm. Coming to the effect of arm position: If the upper arm is below the level of the right atrium, that is, when the arm is hanging down while in the sitting posture, the reading will be too high. Similarly, if the arm is above the heart level, the reading will too low. These differences can be attributed by the effects of hydrostatic pressure and it is around 2 mmHg for every inch above or below the heart level. Several studies have shown that the blood pressure measured in both the arms may be little different, almost all have reported finding differences, but there is no clear pattern, so the usual conception that it is higher with the right arm is probably not true. Nevertheless, it is recommended that blood pressure should be checked in both the arms at the first examination and when there is a consistent inter arm difference arm with the higher pressure should be used. Exception is, for a screening purpose, if one measurement has to be done, it has to be in the right arm. Device selection: Gold standard remains the mercury sphygmomanometer, but these are being removed from clinical practice because of environmental concerns about mercury contamination. It is recommended if available, a properly maintained mercury sphygmomanometer should be used for routine office measurements. Mercury manometers are critical for evaluating accuracy of any type of non-mercury device, but there is another very important issue, a trained human using a mercury manometer is still the gold standard and the overwhelming majority of our clinical trial database is based on that method. Hence, as a disciple of evidence based medicine, I think we should insist on mercury sphygmomanometer rather than accepting anything else. Available small, regular and large and a 12-15 inch of stethoscope tubing is recommended having both bell and diaphragm. It has been demonstrated that most frequent error in measuring blood pressure in the outpatient clinic is "miscuffing" with under cuffing large arms accounting for 84% of the "miscuffings" The ideal cuff should have a bladder length that is at least 80% and the width at least 40% of mid arm circumference, length-width ratio 2:1. These are the different cuff sizes recommended for different arm circumferences. The observer must first palpate the brachial and place the midline of the bladder of the cuff (commonly marked) so that it is over the arterial pulsation and over the patient's bare upper arm. The lower end of the cuff should be 2 to 3 cm above the anticubital fossa to allow room for placement of stethoscope. The cuff is then pulled snugly around the bare upper arm. Neither the observer nor the patient should talk during the measurement, I have already highlighted this issue, phase I and phase V should be considered, and it is best heard using the bell of the stethoscope over the palpated brachial artery and not by the diaphragm because these sounds are a low-frequency sounds. Obtain the palpatory or estimated systolic pressure by palpating the radial pulse obliteration, inflate quickly 20 to 30 mm above, deflate slowly at the rate of 2 to 3 mm per second. SBP is the point when the first of 2 or more Korotkoff sound is heard, disappearance is the diastolic blood pressure and it should be repeated after an interval of 1 minute, not before that. It is well recognized that the predictive power of multiple BP determination is much greater than a single office reading. When a series of reading is taken, the first is typically the highest. A minimum of 2 reading should be taken at intervals of at least 1 minute and the average of this reading should be used to represent the patient's blood pressure. If there is a 5 mmHg difference between the first and the second, additional 1 or 2 readings to be taken and averaged. In some scenarios, where the Korotkoff sounds are very faint, one can open and close the fist 5 times after the inflation of the cuff to augment the sound. Another technique is raise the hand, keep it for a while, then inflate the cuff and auscultate, the sounds will be louder. First and the second things may be combined to further augment the sounds. What is the observer requirements: A very close coordination of eye, ear, brain and hand is absolutely essential for a proper and accurate measurement of the blood pressure. There are few special issues I like to discuss; ambulatory monitoring, home blood pressure monitoring, white coat hypertension, masked hypertension, orthostatic hypotension, and pseudohypertension. BP has a reproducible circadian profile with highest value during the awake hours and lowest during sleep. White coat effect is noted in as many as 20% to 35% of the patients diagnosed as hypertension. ABPM, these devices use either a microphone to measure the Korotkoff sounds or a cuff that senses the arterial waves using the oscillometric techniques, ensure that at least 2 measurements per hour are taken during the usual waking hours and use the average of at least 14 measurements during the person's usual waking hours should be taken to confirm the diagnosis of hypertension. The NICE guideline, recently they have incorporated this measurement of ambulatory or home blood pressure assessment for confirmation in stage I and stage II hypertension. In stage III, it is not required. However, JNC 7 did not mention about the confirming hypertension by ambulatory or home blood pressure. These are the areas where JNC 7 recommended that ambulatory blood pressure monitoring is helpful. Ambulatory values are lower than the clinic values. Awake hypertensive individuals have an average blood pressure above 135/85 and during sleep it is more than 120/75. The level of BP measurement using ambulatory blood pressure monitoring correlates better than office measurement with target organ injury and ABPM also provides a measure of percentage of the BP reading that is above normal. It sets out the 4 nocturnal patterns of blood pressure, extreme dippers where the dip is more than 20%; dippers where the dip is between 10 to 20%; non-dippers, dip is less than 10%; and reverse dipper or risers where there is a rise in the blood pressure at night. This is the average systolic blood pressure what is considered. This slide shows there is a J-shaped relationship between the dipping status and the stroke incidence, the highest being in reverse dippers and extreme dippers. Home blood pressure monitoring has again a set pattern for that. If one need to confirm the diagnosis of hypertension, one should ensure for each blood pressure recording, 2 consecutive measurements are taken at least 1 minute apart with the person seated and the blood pressure is recorded twice daily, ideally in the morning and the evening, and BP recording continues for at least 4 days, preferably 7 days. First day's record should be discarded and the average of the rest of the records should be considered as his blood pressure. This is a very tedious and time-taking procedure. White coat hypertension, we are all aware of, during the medical contact there is a rise in the blood pressure, but out of office, blood pressures are normal. Their risk is intermediate between true hypertensives and those who are normotensives. Masked hypertension is just the reverse of white coat hypertension. Here in the office, the reading is normal, but during the activity and out of office, reading is elevated. It can affect more than 10% of the patients. It clearly increases the cardiovascular risk. Orthostatic hypotension is defined as a drop of 20 mmHg systolic and 10 mm diastolic within 3 minutes of standing. It can be asymptomatic or symptomatic. There is another term called initial orthostatic hypotension. It is defined as a decrease of more than 40 mmHg systolic immediately on standing with rapid return to normal within 30 seconds. One should measure the BP in the supine posture, then ask the patient to get up, stand without removing the cuff, it should be repeated at 1 minute and at 3 minutes and additional measurement should be taken if the patient is symptomatic. Pseudohypertension is intra-arterially the pressure is normal, but in direct record, pressure is elevated. Elderly patients with chronic kidney disease or diabetes, they are more predisposed. It is more common in man and hypertensives those who had a history of stroke. Osler's test, that is, inflate the cuff to occlude the artery and you can roll the brachial or the radial artery even when the cuff is inflated that is a test often done, but it has a low sensitivity and specificity. If it is suspected, it is better to confirm it by intra-arterial record. 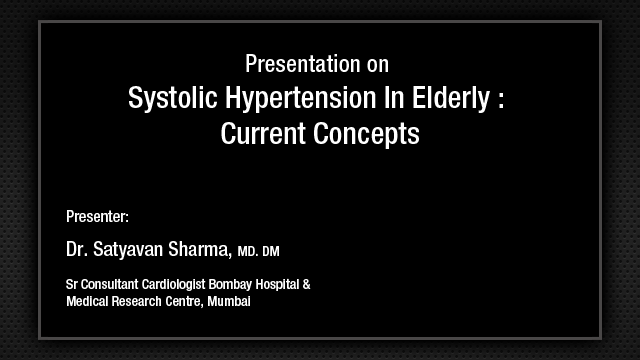 Few special scenarios: In the elderly, they are predisposed to white coat hypertension, isolated systolic, pseudohypertension and postural hypotension. In pregnancy, 2 points to be discussed, one is a left lateral recumbency is a reasonable alternative to supine or sit-up posture and Korotkoff sounds phase V should be taken until and unless one can hear the sounds right up to 0, in that case Korotkoff IV phase sound should be considered. In obese, larger cuffs are often required, very long cuff may be required, but if the patient is very obese, in that case the cuff may be applied over the forearm and radial artery may be palpated and auscultated at the wrist. Arrhythmia can often produce some error in blood pressure measurement. Bradycardia if severe can cause some error. Here, the clue is one need to deflate more slowly. The rate of deflation is 2 to 3 mm/sec that is normal. In this case, it should be 2 to 3 mm/beat, that means the rate of deflation should be slower. Another one is atrial fibrillation where we often get wrong records of blood pressure because of the variation of the stroke volume. Here what should be done is multiple readings should be taken and it should be averaged. While measuring an individual reading, one should ignore an occasional Korotkoff sounds and one should concentrate on the point where the successive Korotkoff sounds are heard. Multiple readings and the mean minimizes the error. So, to conclude, accurate measurement of blood pressure is essential to classify individuals to ascertain blood pressure related risk and to guide management. Regulatory agency should establish standards to ensure the use of validated devices, routine calibration of equipment, and training and retraining of the manual observers. Use of automated devices does not eliminate all major sources of human error. The training of observer should be required even when automated devices are used. Mercury manometer is still the gold standard. Thank you very much for a patient hearing. Comments from Chairperson: Thank You Dr Guha, I think the basics are most essential at any level of practice and any level of clinical understanding. I am sure it must have put to rest lot of disturbances in mind regarding how to measure accurately a blood pressure, but I am sure still this might have bought forth many further questions, I think I anticipate lot of questions for Dr Guha. Question from Audience: Average life of a mercury sphygmomanometer if used properly. Dr. Santanu Guha: If it is not damaged, you can keep it. Problem is, there are 2 components, one is the inflation devices and all, that need to be changed because there will be cracks on the rubber tubing, there may be leak in the valves and other things, but the mercury column per se, if it is not broken, it can be used lifelong. Question from Chairperson: The mercury instrument, I agree with tubings and the cuff, but regarding the calibration, how frequently needs to be done in servicing of the column? Dr. Santanu Guha: It is mentioned that unless it has been contaminated by something inadvertently, you need not do anything, that is because, there are 2 reasons why it can be damaged, one is if you use a glass tube that can be broken, there may be some small leaks that can contaminate the thing, but otherwise you are directly seeing the column of mercury, if it is not contaminated, you need not validate it. Question from Chairperson: Sometimes while inflating, a fragmentation occurs. Dr. Santanu Guha: Fragmentation, that is because air gets in. Question from Chairperson: So that needs to be recalibrated again? Dr. Santanu Guha: That has to be put back in another panel and that has to be recalibrated, yes definitely. Question from Chairperson: In hybrid sphygmomanometer every time we record BP, there is a recalibration which is the best solution. Every time we record BP there will be first 0 and then you will get the BP. Dr. Santanu Guha: That is the whole problem, you have to calibrate and validate it almost each time you use it, particularly electronic devices. Dr. Santanu Guha: Whether that validation is proper that needs to be checked again. It is the non mercury he is talking about. Dr. Santanu Guha: Yes, exactly that I have shown you on one slide. Using a Y-tube, you put one end with aneroid, the other end with mercury and you inflate the cuff, fix it at different level that is the AAMI protocol. At different levels you have to fix it, say at 200 you have fixed it, the aneroid is reading 201 that is well, acceptable, but if the aneroid reads 204 that should not be used, that is, the percentage of margin of error should be +/- 3, it should not exceed that. At different level, you have to do that and validate. Question from Audience: How to calibrate our standard mercury sphygmomanometer? Dr. Santanu Guha: It usually does not require any calibration until and unless it has been damaged or contaminated. In that case, you have to calibrate it comparing it with another mercury sphygmomanometer. Comments from Chairperson: Thank You Dr Guha, it has been an interesting exposure to the basics of taking blood pressure. Thank You very much.